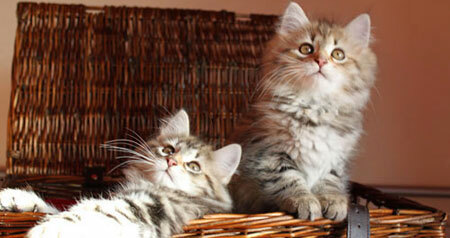 Dear Siberian Cat Lovers! Welcome to our new e-newsletter. Happy New Year to all our kitten slaves and prospective adopters! The first four months were crazy busy as I continued my 'chauffeur' duties. Due to work and family commitments, we were not able to have any kittens at that time. We did however manage to venture out to our two local shows and our very handsome Witchfyre Krasni Kirill took best SLH kitten at the Lancs Show. Thank you D Butters! Our first kittens arrived in June from Goldenesima Alexandr and Koolble Amelie....what a match, five stunning boys and our first homebred blue-golden. In September Boudica and Baroque produced two more boys...both golden tabbypoints Neva Masquerade). One will be jetting off to Germany soon and the other will stay here for now as this is the last of my Belphie line; Boudica will be spayed this month and will be looking for a forever home. Contact me for more details. No more kittens in 2015 as we waited for the arrival of our grandson Harry in November. We are delighted as he is the first boy in this generation after four girls! Goldenesima Belenus (blue golden tabby point (Neva Masquerade) and white) x CH Witchfyre Silvalaska (tortie silver shaded). Colours expected Brown or blue, black/blue silver, tortie/tortie silver, red/cream, red/cream silver mackerel or classic tabby; with our without white. As Laska carries dilute and golden, we are keeping our fingers crossed for a blue golden girl in this mating. Colours expected. Red/red silver, tortie/tortie silver, black silver with or without white. Hoping for that elusive red girl from this mating! Colours expected: Golden, blue golden, silver, with white and colourpoint (Neva Masquerade). If you are interested in any of the above matings please contact me now. I will be keeping a small waiting list once pregnancies confirmed. We may have one more mating for Autumn/Winter kittens. Details later. If you want to sign up to our monthly newsletter go to CONTACT page.